Preheat oven to 150°C/300°F. For the parsnip purée, peel parsnips and cut into medium-sized cubes. Finely dice shallots. Sauté parsnips and shallots in butter until translucent, then deglaze with white wine. Season with salt, nutmeg, and lemon juice. Add heavy cream, vegetable stock, season with pepper, and let simmer for approx. 15 min. at low heat until soft. Stir occasionally. Mash with potato masher. Set aside and keep warm. For cassis-figs, peel figs. Caramelize powdered sugar in a small saucepan, then deglaze with red wine and cassis syrup. Add butter, lemon zest, and let simmer at medium-high heat for approx. 10 – 15 min., until reduced. Marinate figs in cassis reduction and set aside. Make cross-wise incisions along the skin of the duck breasts. Be sure not to cut through the skin. Season with salt and pepper. In a large frying pan greased with vegetable oil, sear skin side of duck breasts together with rosemary and thyme over medium-high heat for approx. 1 – 2 min., or until crispy. Transfer pan to preheated oven and bake at 150°C/300°F for approx. 12 – 15 min. until cooked through but still tender and pink inside. Remove from oven, wrap in aluminum foil, and let rest for approx. 5 min. To serve, slice duck breast and halve figs. 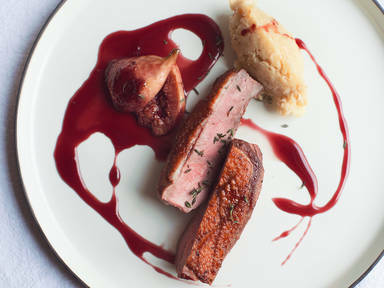 Arrange on serving plates together with parsnip puree, then drizzle with cassis reduction and sprinkle with thyme.